Pioneers in the industry, we offer bone & meat cutting machine, microprocessor automatic tissue processor, dead body weighing scale, hydraulic dissection table, rotary precision microtome (semi automatic) and automatic tissue processor from India. 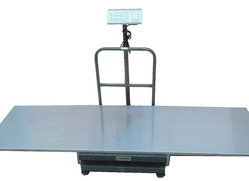 This for preparing specimens of large size in Anatomy Departments.It is fitted with a large moving table and extension table operated on four ball-bearing roller. Duly Automated Electronic PLC (Microprocessor) Control for processing of tissue sample. Capacity of more than fifty cassettes simultaneous processing. 10 regent containers, 2 bath with heating elements on board and basket rotors. PLC (Microprocessor) based programmable immersion hold time during each step. Programmable agiation and rotation within reagent container. 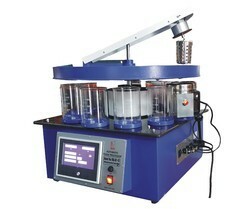 Programmable wax bath temperature control with alarms for temperatures beyond set limits. Programmable Delay Action of 1 hour to 99 hours. ·	2 Stainless Steel Wax Bath.·	2 Stainless Steel Baskets.·	60 Tissue containers (Cassettes).·	1 or 2 Stainless Steel basket rotors (as per customer's requirements.·	10 without lip glass beakers (1 Ltr. or 2Ltr.). Platform made of Stainless Steel 304 grade. Single Digital LED Display. Operated on 220V. Cap 200-250 Kg. 3. Table Top made of 304 grade. Having dissecting area & sink. 4. Dissecting area have removable Grid Plates. 5. Hydro-aspirator with reverse flow features and have hot/cold water fixtures with wrist blade handles and gooseneck. 7. Faucets have rinse with hose fittings and hose hanger. 8. Down draft ventilation system. 9. Disposer unit have solenoid valve, vacuum breaker with on/off switch control and internal overload protector, ½ to ¾ HP motor or slow motion hydraulic up-down. 10. Polyurethane / Wooden head rest to support neck while dissection. 12. Scale support socket able to hold the scale support bar steadily. 13. Scale support bar able to hold the dial type weighing scale. 14. 5 kg dial type weighing scale. 15. Polyurethane Dissecting Board : 2 x 1½ x ¾ inch, grained surface, white. 16. 2 nos. electrical switch & socket 15/5 amp. Fitted on side. 17. Power input to be 220-240 V, AC 50Hz fitted with Indian Plug. 18. The Table can also fabricated as per customer requirement / specifications. 19. Polyurethane Dissecting Board : 2 x 1½ x ¾ inch, grained surface, white. 20. 2 nos. electrical switch & socket 15/5 amp. Fitted on side. 21. Power input to be 220-240 V, AC 50Hz fitted with Indian Plug. 22. 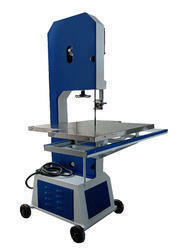 The Table can also fabricated as per customer requirement / specifications. Rescholar Microtome is a semi-automated rotary microtome ideal for routine sectioning and research application in pathology, histopathology textile and other research laboratories. Easy operation, safety & high precision specimen feed, stable performance to provide high quality sectioning results. Universal specimen holder is provided along with a standard cassette holder for paraffin embedded tissues. FEATURES:1. All important controls are easily accessible and conveniently located. Operations are from display board. LCD Screen shows section thickness range. It has different sectioning modes such continuous, single step stroke and program mode.2. It has stepper motor with range of 30mm feed motion and vertical stroke of 60mm. The coarse feed mode for both forward and backward movement through separate feather touch switch.3. Knife holder designed to use with high profile & low profile disposable blades with two pressure plates. It has integrated knife guard to hold disposable knives firmly for vibration and charter free operation. Knife holder has lateral adjustment facility to use of entire length of disposable knife.4. Supplied with a standard universal chuck/block holder with precise adjustment in X and Y axis for orientation of specimen. Smooth hand wheel with integrated quick lock mechanism for safety of operator.5. External Enclosure/Large Waste Tray provided, which is easy to clean and unload the waste.6. It works on a power supply of 110-220 VAC at 50 Hz. 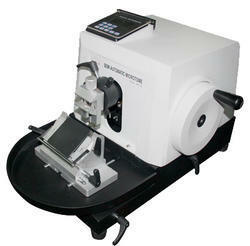 SEMI AUTOMATIC MICROTOME: features motorized specimen advance along with digital control and settings. 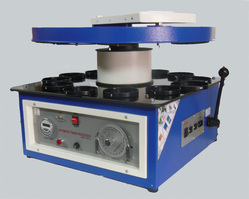 Coarse feed specimen advance is automatic in semi-automatic microtome along with manually operated specimen feed hand wheel. Equipped with latest micro switch mechanism for trouble free performance and convenience in use. Complete with latest built in safety device to protect tissues from 10th stage and 11th to 12th stage that is in wax during electric failure. Overall Dimension – 16”x16”x32” (LxWxH). Made of mild steel duly power coated. Having one drawer & one box. 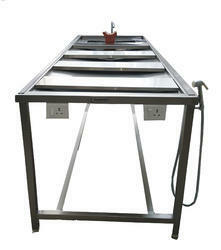 Top made of 304 grade stainless steel with three sides raising edge. •Continuous air flow along entire work area. •Integrated illumination with UV germicidal light. •Working area of 5’x2.5’x3’ and sides made from Acrylic material. •Self supporting under carriage with adjustable legs. •Adjustable set of stools with rest to reduce back strain. •Magnifying glass/light magnifier with flexible arms. 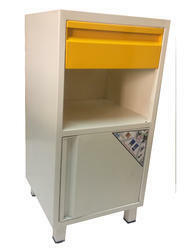 •Document holder for requisition forms, literatures etc. 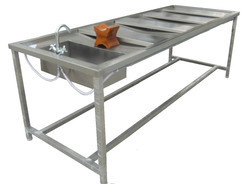 •Steel basin with adjustable valve with formalin pour off basin. •Study perforated insertable work plates. •Sprinkler system with adjustable valve for bath sanitation located underneath the perforate working plates. 2 nos. electrical switch & socket 15/5 amp. Fitted on side. Table Top made of 304 grade. Having dissecting area & sink. Dissecting area have removable Grid Plates. 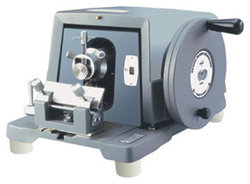 RESCHOLAR Senior Precision Rotary Microtome Model RM-303-01 is the most precise and uniform sectioning equipment for use in Medical Colleges, Universities, Research Laboratories, Hospitals and Educational Institutions. 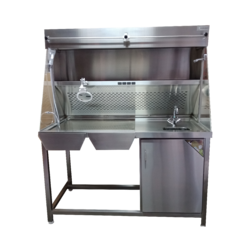 The internal mechanism and knife holder rests on a heavy-duty and rigid base to render a shake proof operation. The Protective aluminum cover is hinged to the base and swings back so that the interior parts are completely exposed for convenient setting, cleaning, lubrication etc. Feed mechanism is dependent upon the vertical movement of the object block. With every complete revolution of the counter balanced drive wheel, the feed pawl engages with the teeth of the ratchet gear which moves towards and advances the object holder through a cone inclined plane mechanism in precise increments so that the tissues can be sectioned even to a thickness of one micron. When the limit of the feed reaches at the end, a safety device automatically disengages the feed mechanism to prevent jamming and avoid damage to the feed screws. The feed indicator is graduated in microns, is conveniently located in the front for instant references and its setting is controlled by a knurled knob at the back of the microtome. The sturdy knife holder, in addition to knife elevating and leveling provides lateral movement for complete use of knife edge. The angle, adjustable up to 30o, is indicated on a reference scale. The knife supplied with the Microtome is fabricated from high carbon fine grain tool steel which is heat-treated for proper temper & tested for Micro structures. Net Weight	:	30 Kgs.Total Feed excursions	:	28mm. Object Holders (3 Nos.) :	1 Set	Lubricating Oil Bottle	:	1 No.Knife 120mm in a box	:	1 No. Dust Cover	:	1No. Honing Stone	:	1 No. Operating Manual	:	1 No. Looking for Medical Equipment & Furniture ?